One humble request to all the people planning to go to for treks. Please respect nature and remember other people. Never litter these wonderful places. Infact, it will be great, if you can pick up some of the litter (especially the non-bio-degradable) and carry it back. Please abstain from smoking and drinking when you are with nature. Even if you cant help it, atleast carry back cigarette buds and liquor bottles. If couple of us show some responsibility, we can keep these places clean and pristine for the coming generations!!! A trek to Antharagange turned out to be a lot more interesting than I originally anticipated. The first visit was meant to be a family picnic with some cave exploration thrown in, but we failed to reach the peak. In the second visit, I managed to reach the pool hill which is probably the water cache for the entire hills and the source of water at the caves. The peak was covered with huge boulders and thorny bushes all around - so I had to abort and come back after a memorable solo exploration. Kurinjal was everything I wanted from a monsoon trek. A lot of greenery, lovely streams, misty mornings, but clear views at the peak and effortless trekking in a light drizzle - we stayed at the beautiful Bhagavathi nature camp for a trek to Kurinjal, before visiting the wilderness of Gangamoola and the voluminous Hanuman Gundi falls the next day. Amazing would be an understatement to describe our Lohjang - Didna - Ali & Bedini Bugyal - Pathar Nachuni - Roopkund - Wan trek. Beautiful vistas - from rivers and water falls to forests to grasslands and snow capped mountains, experiences - from hot and sunny to rain and snow fall, altitude changing from ~2350m to ~4830m, legends, adventure - Roopkund had it all! A re-visit to Agastya Mala - Pongalappara - Athirumala from Bonacaud, turned out to be almost perfect. This time we had three days to do the trek, making it much more relaxed than the last time. But, the real highlight was the breath-taking views from the peak, including the five Anjila Pothigai hills jutting out from the cloud cover. I have found Mullayanagiri one of the easiest places to go back to, due to its location at a convenient distance from Bangalore. 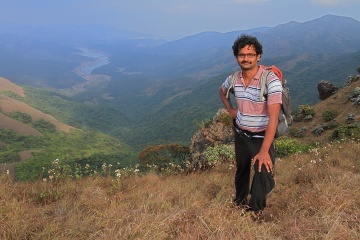 Reaching the peak too is relatively easy, in spite of it being the tallest in Karnataka @ 1930m. This time, we managed to do the complete Sarpadhari - Mullayanagiri - Kavikalgandi - Baba Budan Giri - Manikyadhara trek and was blessed with clear views all around.